NASA researchers in California are using a modern version of a 150-year-old German photography technique to capture images of shock waves created by supersonic airplanes. Over the past five years scientists from NASA's Armstrong Flight Research Center at Edwards Air Force Base and Ames Research Center at Moffett Field have teamed up to demonstrate how schlieren imagery, invented in 1864 by German physicist August Toepler, can be used to visualize supersonic flow phenomena with full-scale aircraft in flight. The results will help engineers to design a quiet supersonic transport. Although current regulations prohibit unrestricted overland supersonic flight in the United States, a clear understanding of the location and relative strength of shock waves is essential for designing future high-speed commercial aircraft. Schlieren imaging reveals shock waves due to air density gradient and the accompanying change in refractive index. This typically requires the use of fairly complex optics and a bright light source, and until recently most of the available schlieren imagery of airplanes was obtained from scale model testing in wind tunnels. Acquiring schlieren images of an aircraft in flight is much more challenging. Ground-based systems, using the sun as a light source, have produced good results but because of the distances involved did not have the desired spatial resolution to resolve small-scale shock structures near the aircraft. More recently, synthetic schlieren techniques have been developed based on image processing methods. One, called background oriented schlieren (BOS), has been particularly successful in wind tunnel tests. First, researchers obtain an image of a speckled background pattern. Next, they collect a series of images of an object in supersonic flow in front of the same pattern. Shock waves are deduced from distortions of the background pattern resulting from the change in refractive index due to density gradients. This method requires very simple optics and a variety of background patterns, including natural ones, may be used. The complexity with this method is in the image processing and not the hardware or positioning, thus making BOS an attractive candidate for obtaining high-spatial-resolution imaging of shock waves in flight. 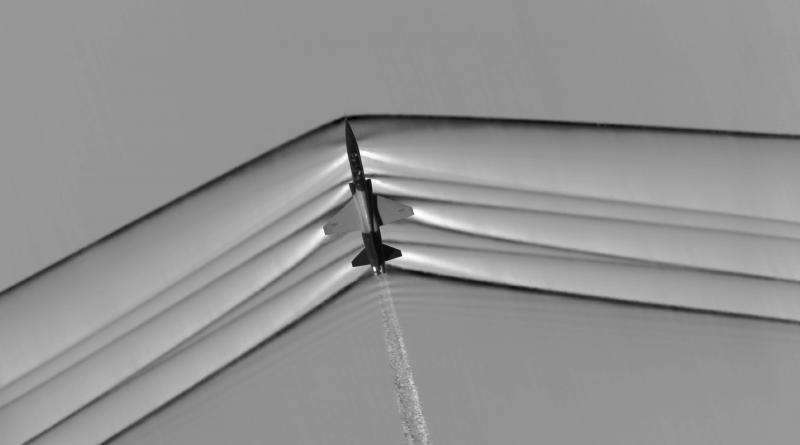 In April 2011 the first phase of air-to-air flight-testing at Armstrong, dubbed AirBOS 1, showed positive results and proved the feasibility of using the BOS technique for imaging supersonic shock waves created by a NASA F-18. A high-speed camera on the underside of a NASA Beechcraft B200 King Air captured 109 frames per second while the supersonic target aircraft passed several thousand feet underneath in straight-and-level flight at speeds up to Mach 1.09 (Mach 1 is the speed of sound, which varies with altitude, but is about 768 mph at sea level). Researchers acquired imagery with a relatively simple system consisting of a laptop with a frame grabber and using natural desert vegetation as the speckled background pattern, a method the team dubbed "Tumbleweed Tech." 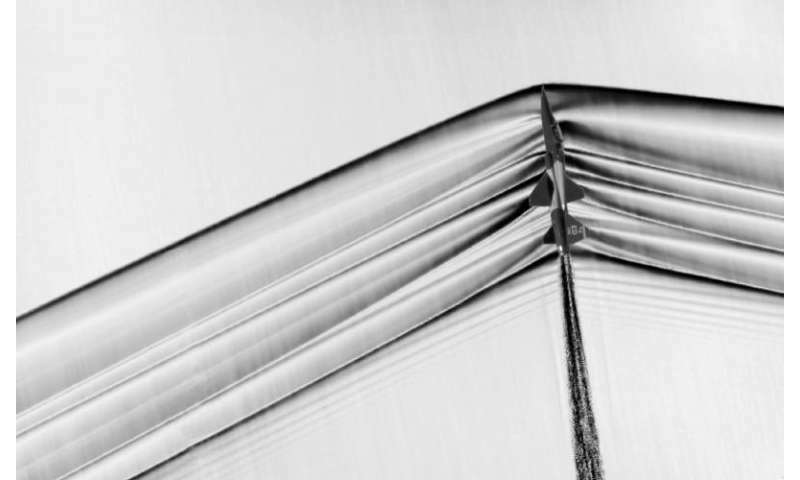 "Air-to-air schlieren is an important flight-test technique for locating and characterizing, with high spatial resolution, shock waves emanating from supersonic vehicles," said Dan Banks, Armstrong's principal investigator on the project. "It allows us to see the shock wave geometry in the real atmosphere as the target aircraft flies through temperature and humidity gradients that cannot be duplicated in wind tunnels." "After much planning and a little luck we were able to acquire in-flight images and process the data, achieving results the first time out," said J.T. Heineck, the NASA Ames principal investigator who originally proposed the idea of using the background oriented air-to-air technique. Ed Schairer, Heineck's colleague at Ames, where a provisional copyright for AirBOS technology and related flow visualization applications has been filed, wrote the code with which these images were processed. This technique shows not only shock waves but all density changes including vortices and engine plume effects. Future work may include imaging subsonic aircraft flow fields. The next step was to advance the technology, optimize it wherever possible, and determine the feasibility of using AirBOS to obtain imagery beyond the top-down view. The second AirBOS campaign conducted flights in September and October 2014 at Armstrong, and involved both NASA F-18 and F-15 aircraft as targets. For this series, Heineck designed an imaging system with higher resolution and faster frame rate cameras in order to acquire more images per pass and then average the results from each image. NASA technicians installed the two state-of-the-art high-definition, high-speed cameras in the King Air in addition to the original AirBOS equipment. Images from the new cameras represented a dramatic improvement over those produced by the original system. The use of different lens and altitude combinations and knife-edge aircraft maneuvers by the pilot of the target aircraft provided the opportunity to obtain side-on images. Researchers continued to refine and improve techniques during the AirBOS 3 series in February 2015. 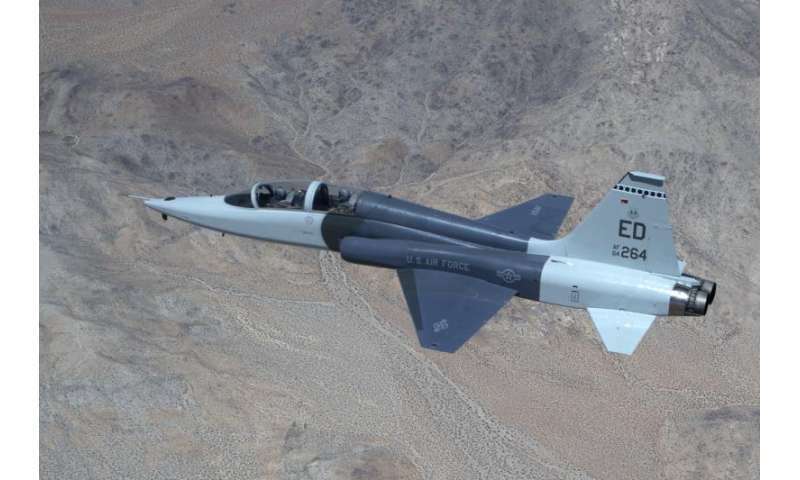 Supersonic target aircraft included a NASA F-15 anda T-38C from the Air Force Test Pilot School (TPS) at Edwards. Air Force test pilots Maj. Jonathan Orso and Maj. Jeremy Vanderhal spent several weeks working with NASA to plan the T-38 flights and determine how to precisely align the jet's flight path beneath that of the B200 to capture the schlieren images. Synchronizing the flight paths of the supersonic T-38 and subsonic King Air required complex integration of the airplanes' navigation systems to ensure that both would be properly positioned over the background target area. "Safely coordinating two very dissimilar aircraft, operating in close proximity and with a rapid closure rate required a total team effort between NASA, the 412th Test Wing, and TPS," Orso said. To obtain detailed images, Orso and Vanderhal had to fly the T-38 directly underneath the King Air. According to Vanderhal, "These passes posed a unique safety and technical challenge due to the small window of time during which the camera could view the target aircraft." Following each flight the AirBOS team used NASA-developed image processing software to remove the desert background and reveal rough shock wave images. Next, researchers combined and averaged multiple frames to produce clean and clear images of the shock waves. The AirBOS effort was funded by NASA's Aeronautics Research Mission Directorate and managed by the Commercial Supersonic Technology (CST) project in the directorate's Advanced Air Vehicle Program. CST Project goals include providing research and leadership to enable the development of a new generation of supersonic civil transport aircraft. The project's near term objective is to develop the tools and integrated concepts that will enable demonstration of overland supersonic flight with acceptable sonic boom impacts. The current regulatory prohibition against flight that produces a sonic boom over populated areas is viewed as the principal barrier to future supersonic civil aviation. "It is hoped that the AirBOS images can be used to validate or improve current design techniques," said Brett Pauer, CST project support manager at Armstrong, "In addition, this research technique may be used to validate design models of future prototype and demonstrator low-boom aircraft." According to Tom Jones, CST Project's associate project manager for flight, "The end goal is to facilitate the ability for a new speed regime and open a new commercial market for civil transportation." I suppose the next step in this schlieren technique is to compute a tomographic 3D model from the 2D views of the aircraft shock field.